Over the weekend we decided to do a bit of a taste test. 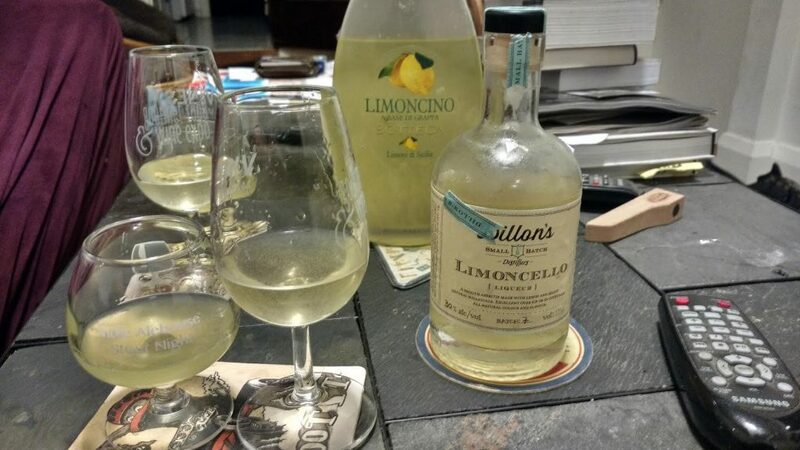 We had a bottle of Italian limoncello that Shawna had picked up during a trip to the beautiful country a while back along with a bottle made by Dillon’s. Limoncello is a traditional spirit made mostly with lemons and a few aromatics for taste. Dillon’s says that they took liberties with the recipe which would explain why it tasted very different from the traditional Italian variant we pitted it up against. Dillon’s suggests this as an aperitif but we strongly disagree and would only suggest this for after a meal. The flavours described below are STRONG. This isn’t a hint of this or a hint of that. They say it doesn’t contain as much sugar as a traditional recipe but we still found it quite sweet. Limoncello can only be purchased direct from the distillery. It sits at 30% ABV and I honestly don’t remember the price. Appearance: Bright yellow, unfiltered, lots of sediment. Aroma: Confected lemon. Lemonade. Summer leaves. Zest. Taste: Alcohol burn at first and lots of lemon rind. Then the candy comes on and sugar hits you hard. Overall: Shawna says pour it over Greek frozen yogurt and I agree. Great as a digestif.